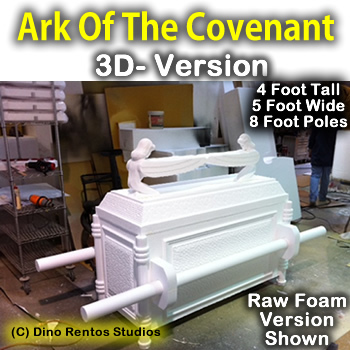 Ark Of The Covenant Full 3D Foam Prop - Dino Rentos Studios, INC. This amazing foam prop display of the Ark Of The Covenant is a great addition to your display area or stage production. This prop is full size. The box is 5 foot wide by 25" deep and over 4 foot tall. The poles are 8 feet long. Painted foam version weighs approximately 22 pounds. 1) Plain foam: Paint the Ark Of The Covenant prop yourself. Just use water-based paint. 2) Fully painted foam, ready to use. 3) Plastic coated for durability and fully painted, ready to use.